I got back yesterday from Iowa after participating in the 38th addition of RAGBRAI. For those of you who don’t know what RAGBRAI is, the one sentence explanation is that it is part state fair and part Bay to Breakers1 executed on bicycles across the state of Iowa. It’s a lot of fun. I did a couple of days of last year’s RAGBRAI, and this year our group did four of the seven days, starting in Clear Lake and finishing in Dubuque. Most of the four days was fairly uneventful bike riding covering some 220 miles, with the exception of a major storm system on the start of my third day (RAGBRAI day 6) and almost wiping out on one of Iowa’s less well maintained roadways. However, the last day held something a little special for everyone this year: Potter’s Hill. I had heard rumor and conjecture about some “monster” or “killer” hill, but it wasn’t until heading down a large hill into the lovely town of Graf that I realized the legend of the hill might hold some weight. You could really open it up going downhill into town; a couple of people told me that their bike computers recorded them going 45 miles per hour. It occurred to me there was likely a similar slope on the other side of the valley, only we’d have to go up it. It turns out Iowa isn’t as flat as it’s made out to be. But still, riding through the valley town I didn’t think too much of what was to come. And then we turned the corner out of town, and I saw what could only be the “monster” hill: Potter’s. It was obvious because everyone, and I mean everyone, was walking up it. I was shocked. There were literally a thousand people walking their bicycles up. I’d seen people walk bikes up hills in RAGBRAI before, but not like this. Being that I live in California, I’ve been on some hills and although imposing I thought Potter’s Hill was doable. So I gritted my teeth and shifted some gears. The rest of my group dropped off, but I just shifted lower, and when there was no where lower to go, I got out of the saddle and grinded it out. It was made significantly more difficult by the masses of people walking bikes and three vehicles going up the hill in left lane. But I kept thinking that I could do hills in Cali and this couldn’t be as difficult. In fact, I was thinking of one hill in particular that I ride sometimes after work, Moody Road in Los Altos. It’s a fairly difficult climb, much longer, and seems to evoke a sense of awe in the local cyclists. So as I was weaving through walkers, dodging am RV, breathing hard, and cursing like a sailor, I kept thinking if I can do Moody I can do this. 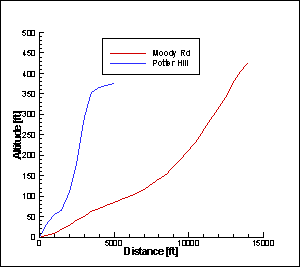 Moody Road had beat me a few times, but I wasn’t going to let some hill in Iowa beat me. But I also didn’t see anyone else do it. I honestly passed a thousand people all walking their bikes up this hill. Now granted, I know other people must have done it, (I am fairly certain that a old man with a ZZ Top beard and only one arm who passed me on a later hill must have been able to do Potter’s), but I did not see any of them. And granted this was probably at one o’clock in the afternoon, towards the back of the RAGBRAI pack and not with the more serious cyclists who probably uniformly cranked it out earlier in the day. But still, to not see anyone climb the hill was shocking, and as I’ve had time to let it sink in, only more so. 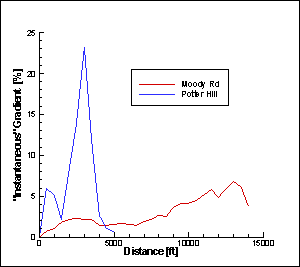 It lead me to wonder: how hard is Potter’s Hill? Now, I’m fairly new to this whole cycling business. It’s been exactly a year, since last RAGBRAI, that I starting biking again after what I can only think has been a 16 year hiatus, having stopped sometime in junior high. So my actual experience on a bike is pretty limited. In the last year I’ve purchased a bike2 and done some riding around the Bay Area, but it hasn’t been as much riding as I had hoped. My only real world experience for a point of comparison is Moody Road. So that’s the comparison I’m going to make. I’m not entirely sure about the 23% point, but MapMyRide has that section at 19%. Suffice it to say, the middle of the Potter’s Hill climb was very very difficult, if only briefly. Much more difficult than Moody Road overall. But how does it compare to the real deal, what the pros ride? How does it compare to say, the 2010 edition of the Tour de France? A cursory look at the Tour’s website revealed to me that most category 4 climbs4 on this year’s Tour were more difficult than both climbs. In fact, by my no-means-complete survey of the climbs, they all seem to be just barely more difficult than Moody and longer than Potter’s. But one jumped out as seeming to be less difficult than RAGBRAI’s climb: Stage 3 went from Wanze to Arenberg Porte du Hainaut with only one categorized climb, a category 4 climb that was 1.4 km long with an average gradient of 3.4%. So there is a chance that if Potter’s Hill climb was included in the Tour that it would be categorized. Granted it’s certainly not the Col du Tourmalet, but still a categorized climb is supposedly a challenge even for professionals, a rare thing. So yeah, tip of the old cap to you Iowa, you really are not that flat. Only mostly flat, with some rare steep parts. So why am I talking about this on McChoppin’? After all, as the Slickman is quick to point out, riding a carbon fiber racing bike isn’t exactly old timey. But McChoppin’ is also about pushing yourself to the limits. And I think I pushed myself beyond what I had previous thought my limits were on Potter’s Hill. That feels really good. Thanks RAGBRAI for throwing a serious challenge into an otherwise low-key bicycling event. I know not everyone enjoyed it, but I honestly think more people could have done it with the right mindset. I know for a lot of people on RAGBRAI the challenge may just be to do one day out of the whole week, but hopefully at least a few other people did Potter’s Hill who might not have otherwise met the challenge. I’m left with the thought that if I could do Potter’s only because I was thinking the entire time that it wasn’t as bad as Moody, what else do I have in me? What else can I do? And that’s what McChoppin’ is all about. And besides, it’s my damn blog, and I’ll write about whatever the hell I want. 4Category 4 climbs are the least difficult of the categorized climbs. Category 1 and hors catégorie are the most difficult. When included in the Tour, the Col du Tourmalet has been a HC climb since 1980. Curbmaaaaaaan! The time is rapidly approaching. I’ve made a few old timey/ true to period additions i suggest you look into. I think that this year can be our most successful – thats right we’ve come along way from “the year we do not speak of” – and our most authentic. First the Tom Crean sweater. The original wool sweater Crean has on in all the pictures. It’s $160 just about anywhere just google Tom Crean sweater. Also the Hand Made 100% Wool WW1 style balaclava. $50 just google that too. It’s the same thing they had in 1916. I picked up a pair of elbow length reindeer mittens and then made the canvass polar mitten strap they used – easy to do; fold the edges over and stitch em up – you end up with a 5 or 6 foot strip about inch and 1/2 diameter then make a chest length cross brace in the same fashion and stitch it on about pec high. Cant wait to get out there! Social Medias; If you’re into that sorta thing.